A Galaxy of Suns ‘plays’ the stars as they rise and set over 360˚ of the horizon. Tracking the Earth’s motions through space, the work documents in real-time the audience’s precise position in relation to the stars, sonifying stellar data to create a sound and visual composition unique to their location in space and time. A Galaxy of Suns works with parameters such as location on the horizon, brightness, size, age and chemical composition of stars, and translates them into sonic and aesthetic variables including rhythm, pitch, volume, panning, colour and light intensity. 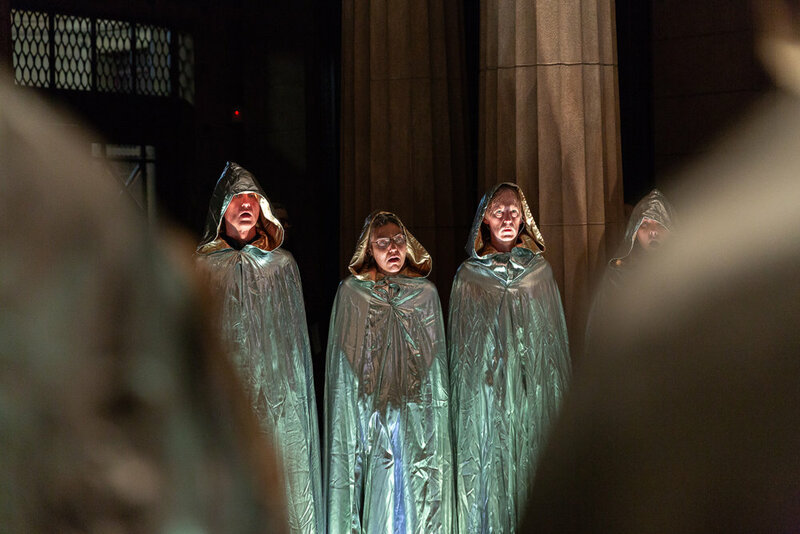 The performance features a 36-part chorus, singing the stars as they rise and set over the horizon. A specifically created app delivers microtonal sonic cues directly to the 36 individual parts, in real-time for the location. Performers are spatially mapped across the performance venue to represent location across the galaxy, with the parts divided according to the ‘pitch’ of each individual star: the slower burning cooler red stars corresponding to the bass notes, and the faster burning hot blue stars corresponding to the upper registers. Sampled tuned percussion accompanies the chorus, with large-scale lighting tracking the progress of the choristers as they sing their way across the sky; the composition building until all 360 degrees of the horizon is represented in sound and light. This iteration was performed in the atmospheric entrance foyer of the Grand Freemasons Lodge in Adelaide. Many thanks to choir leader Jo Pike and the wonderful singers who made this performance possible.